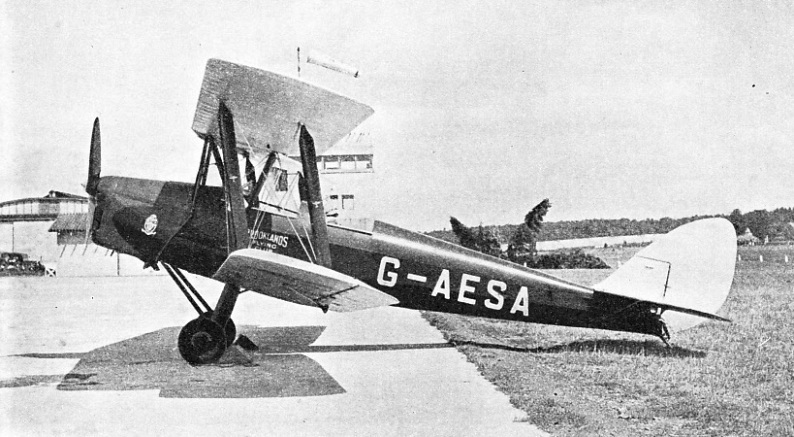 THE TIGER MOTH, a two-seater light training aircraft made by the De Havilland Aircraft Company, Ltd. When a machine is left standing in the open its nose is turned to face the wind. If the wind is strong, chocks may be placed behind the wheels - as in the above photograph - to prevent the wind from moving the machine backwards. AFTER his first lesson in the air, during which the pupil is taught to fly straight and level, he should continue his instruction with as few breaks as possible. Bad weather may cause interruption, but a pupil will learn to fly in fewer hours by having two or three lessons each day than if he does his training at, say, week-ends only. It is also desirable for him to keep to the same machine and instructor. 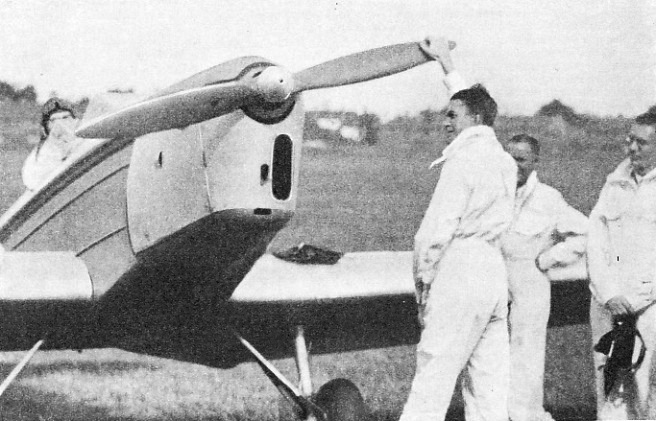 Generally the tail-trimming device can be operated from the back cockpit only, so that the pupil must always adjust this himself. The instructor will ask whether it is in the correct position, and thus help the pupil to develop the habit of always moving it before taking off and landing. Similarly, in machines equipped with wheel brakes and flaps, the pupil will probably have to set the levers controlling these to the positions that his instructor indicates. During early taxying, which will all be done by the instructor, the pupil should note the angle of the machine when on the ground. This will help him later when he begins instruction in landings. The difference between the angles of the machine in level flight and when resting on the ground varies with the type of aircraft. The difference is not so great with modern machines as with older types. 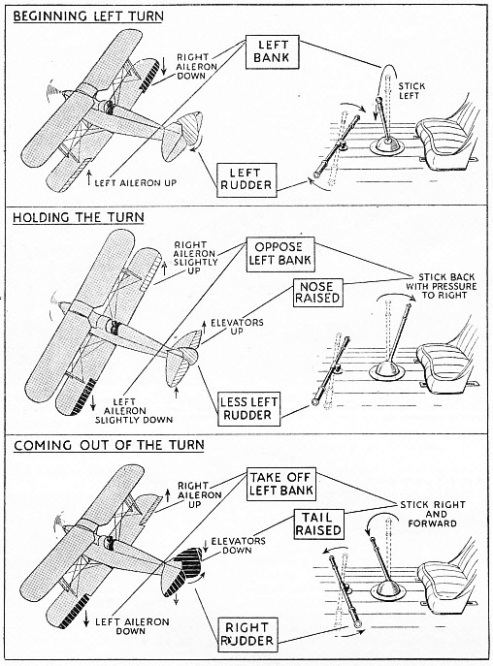 To stall a machine unintentionally is about the most dangerous thing a pilot can do, and so the pupil is shown what stalling is, and how to do it intentionally. At a height over 1,500 feet, and with the engine throttled right back, the instructor pulls the stick farther and farther backwards. The nose of the machine rises and continues to rise until a point is reached at which a noticeable sinking begins. The machine is then stalled, or has lost flying speed The speed at which this occurs depends on the particular aircraft, but is seldom above fifty miles an hour on ordinary light machines. By putting the stick forward, the nose of the machine is lowered and flying speed is picked up again. The pupil now tries the manoeuvre himself, and will find that when the machine is stalled the controls - particularly the ailerons - become “sloppy”, though this is not so marked on a machine fitted with Handley-Page slots. If the stall is held on a machine without slots, one of the wings will eventually drop and the machine will begin to go into a spin to the right or left, according to the wing that drops. This is because the effect of the ailerons has gone completely. No matter how far over to the side the stick is put, the wings cannot be brought level until speed is regained. Slots smooth out the flow of air over the wings and so enable the ailerons to maintain their effect after the stall. That is why the “sloppiness” of the ailerons during the stall is not nearly so marked on a slotted machine: the feel of the ailerons in this instance is, however, appreciably lighter than it is in normal flight. There are two ways of noting when a machine is nearing the stall: by experiencing the decreasing effectiveness of the controls, or by watching the air speed indicator (A.S.I.). The first is what is known as “flying by feel”; the second is flying by instruments. The pupil must learn to fly by feel as well as by the use of the instruments. The machine can also be stalled with the engine on, but in this instance the nose would have to be pulled up higher before the stall occurred. The act of nearly stalling with engine on helps to illustrate to the pupil the best climbing angle of his machine. The instructor will show his pupil the correct angle of climb. It must be memorized by noting the point at which the horizon cuts the nose of the machine in the same way as the position for level flight was noted. The climbing angle is less than that at which stalling begins with the engine on. It is that amount less which gives a firm feel to the controls of the machine plus a little more to provide a safety margin and prevent the engine from labouring. Although the air speed indicator can give some indication of when a machine is climbing, climb should always be noted from the relative position of the horizon and from the reactions of the pupil’s senses. The best climbing angle is always adopted when it is desirable to gain height as quickly as possible. But it is not faulty flying to climb at a lesser angle. It is entirely a matter of suiting the climb to the requirements of particular circumstances. Gliding is flying with the engine throttled right back, and with sufficient speed for the controls to be fully effective. The nose will be lower than in level flight, for the aircraft must be descending to maintain flying speed. The best gliding angle for any machine is found by easing the stick back while gliding until the effect of the controls begins to disappear, and then putting the nose a little lower. These movements of the controls must be made gradually, for temporary effects may give a false impression. The best gliding angle enables the machine to cover the greatest amount of ground for the smallest loss in height, and yet permits full control to be maintained. It is generally represented by an A.S.I. reading of from 60 to 75. TURNING AN AEROPLANE may be divided into three stages. The first stage starts the aeroplane turning, the second enables the pilot to maintain the turn as long as he desires, and the third ends the turn at any required moment. As with climbing, the pupil should memorize the position of the nose of the machine in relation to the horizon when gliding. Correct gliding angles can be judged exactly by the A.S.I., but the pupil, in determining the gliding angle, must learn to rely entirely on his senses and on the “feel” of the machine. Except when only a small distance from the ground, height does not affect the constancy of the position at which the horizon should cut the nose of the machine when gliding. If the pupil is learning to fly in a machine equipped with flaps, he will learn to glide with and without these in use. Flaps are fitted along the trailing edges of the wings and, when in use, lower the air speed at which the machine stalls, and also steepen the angle of glide. 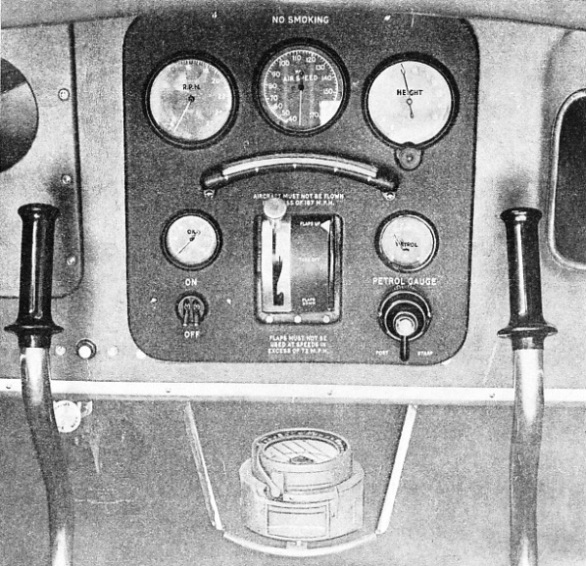 They are controlled by a lever at the side of the cockpit, and may have a “partly on” position as well as a “fully on” position. The best gliding angle with the flaps partly on or fully on is found in the same way as the best gliding angle without the flaps in use. The pupil will note that, when the flaps are partly on, the nose is lower when gliding than it was without the flaps in use. With the flaps fully in use it is still lower. The flaps must not be brought into use when the aeroplane is flying above a certain speed - which on the average trainer with flaps is about 75 miles an hour. Flaps are normally brought into use only before making a landing. Stalling, climbing and gliding instruction is ample for one lesson, and after this the instructor will bring the machine down and give the pupil a rest. Three lessons of from thirty to forty minutes will probably prove as much as a pupil can profitably undertake in one day. Instruction in medium turns will follow gliding. Before the pupil is shown how to make a correct turn with the proper combination of elevators, ailerons and rudder, what is known as the further effect of the controls will be demonstrated by the instructor. He will first attain the usual safe height of over 1,500 feet - safe, because there is ample height for recovery from positions produced by misuse of the controls. The pupil is told to put on bank to one side and keep it on. At first the machine merely slips sideways, but soon the nose begins to drop without any other movement of the controls being made. This is because there is air pressure on the side of the machine to which it is slipping, causing the tail to rise above the nose. After having put the machine back into level flight, the pupil is next told to apply rudder to one side. At first the machine, though skidding sideways, turns its nose round the horizon. In doing so the wing on the outside of the turn moves faster than the inside one, thus obtaining more lift, and begins to rise. The resulting bank, plus the effect of the rudder which is now at an angle out of the vertical, again causes the nose to drop. Because of the particular design of some machines, gentle turns can be made on them with rudder or ailerons alone, and considerable bank or rudder is necessary to cause the nose to drop. To prevent the nose from dropping when a turn is being made, the elevators as well as the rudder and ailerons have to be used. Before the instructor takes his pupil up for the first lesson in turns - which will deal with medium turns with the engine on - he will explain the necessary movements of the controls and the reasons for the movements. The way in which the aeroplane is turned can be considered as divided into three parts - beginning the turn, holding the turn and coming out of the turn. These three parts are illustrated in the diagram shown above. To begin a turn, rudder and bank are put on in the direction of the desired turn, which, for the purpose of this description, is assumed to be to the left. The movement of rudder and stick should be almost simultaneous, but the rudder movement should never precede the application of bank. As soon as a suitable turning angle, say thirty to forty degrees, has been reached, the second part of the turn - holding the turn - is carried out. This consists of moving the stick over to the right and slightly beyond the central position, reducing the amount of left rudder, and easing the stick back. If the stick were kept over to the left in its position for the first part of the turn, the machine would bank more and more steeply because the right wing, on the outside of the turn, is moving more quickly than the left wing, and is therefore obtaining more lift. To counteract this greater lift of the right wing, the left aileron is lowered to add slightly to the lift of the left wing. A balance is thus obtained which is known as holding off bank, and the amount of holding off is largely judged by the feel of the pressure on the stick. The amount of rudder in use is reduced to prevent the turn from becoming too rapid, for more rudder is required to start the machine turning than to keep it turning. The stick is held back to keep the nose up on the horizon because rudder and bank together cause it to drop. Now, by small adjustments of the three control movements, the machine can be kept in a steady turn. 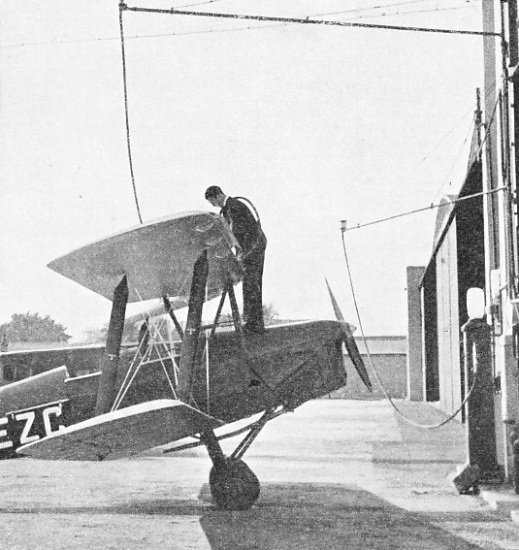 FILLING UP WITH PETROL outside a hangar at Brooklands Aerodrome, Surrey. The Handley Page slot on the leading edge of the upper right wing of this Tiger Moth is in the open position. When the machine gains speed in the air, the slots close back flush with the wing surfaces. To come out of the turn considerable right rudder and right bank are used, and the stick is put forward to keep the nose from rising above the horizon. As soon as level and straight flight is attained the controls are returned to normal ; otherwise a turn in the opposite direction will begin. Before beginning a turn the pupil will be told to level off the machine if he has been climbing. Climbing turns can be dangerous until a fair degree of skill is obtained. At first the pupil will experience a little difficulty in using the right amount of rudder for the degree of bank chosen. Too much bank produces a sideslip; too much rudder will tend to cause skidding and make the nose of the machine drop. Care has to be taken to avoid keeping the nose up by pulling back on the stick when the dropping of the nose is due to the use of too much rudder. If such movements are carried far enough the machine will stall and spin. The bubble of the cross level, by remaining central, will indicate when the controls are being properly used in a turn. Too much bank in a left turn causes the bubble to move to the right; too much rudder moves it to the left. The pupil will find that he has to hold off bank more when turning one way than the other. Which way it is depends on which way the propeller turns, because this difference between right and left turns is due to the twisting of the slipstream from the propeller. Gliding turns, which form an important part of the approach of an aeroplane for landing, are a little different from level turns with the engine on. The same air speed should be maintained during gliding turns as in a straight glide. This requires the nose of the machine to be lower in relation to the horizon, and it is most important to see that speed is not lost during a gliding turn nor increased on coming out of the turn. Because of the particular build of the nose of some aircraft and of the shape of the engine cowling, the apparent distance of the nose below the horizon may not be the true distance. Care has to be taken to avoid turning errors due to this effect. There is little slipstream from an engine that is throttled right back and just ticking over. Because of this the movements of rudder and elevators for a given turning angle will have to be greater in a gliding turn than in an engine-on turn. Moreover, there will be no need to hold off bank in a gliding turn. This is due to various causes, among which is the fact that the inner wing is descending more steeply than the outer, and is therefore obtaining sufficient additional lift to make up for the extra lift gained by the outer wing, because it is travelling through the air at a greater speed. The pupil will find that he has to guard against insufficient bank on his gliding turns, especially when he is near the ground where the bank is more noticeable. Too heavy use of the rudder is a common fault with flying pupils, and much more likely to be dangerous than the use of too much bank. Gliding turns, because they form part of the landing approach, are learnt with and without the flaps in use when the instructional machine is of a type incorporating flaps. Gliding turns are carried out in the same way whether the flaps are used or not. Speed, however, will be greater without the flaps, and the nose of the machine will be lower with flaps in use. Steep turns with the engine on will also be learnt by the pupil. They are not needed in ordinary flying, but help the pupil to grasp thoroughly the technique of turns, and might be required in an emergency. They are a little different from medium turns with the engine on, although the sequence of the control movements is the same. As turns become steeper and steeper, the effect of the controls on the machine’s movements in relation to the horizon begins to change. The elevators turn the nose round the horizon more and more and the rudder raises or lowers the nose to an increasing extent. “CONTACT!” calls out the engineer when he is ready to start the engine of an aeroplane. The pilot repeats the word and immediately switches on the engine. When swinging a propeller, one or two hands may be used, but it is necessary to stand with the weight of the body well over the feet so that there is no tendency to fall towards the propeller when the engine starts. When the machine is doing a vertically banked turn, the effects of rudder and elevators will have changed round completely, the rudder being used to keep the nose at the right height and the elevators to turn the machine. The effects of the controls on the machine will not have interchanged. For instance, no matter what the attitude of the machine, pulling back the stick will always make the nose try to reach the tail over the back of the machine. The change of the effect of the controls on the machine’s attitude in relation to the horizon is a progressively greater one. It occurs gradually between a slight turn and a steep turn, and not suddenly at any one particular degree of bank. Thus a steep turn is made in the same way as a medium turn, but the stick is held farther back to assist the machine to turn, and more rudder is taken off to prevent the nose from dropping. A steep turn is developed from a medium turn, less bank being held off so that the machine is allowed to bank more and more until the turn is steep enough. At the same time more rudder is being used and the stick eased back. Considerable practice is required to execute good steep turns. The pupil will find that not many lessons are devoted to practising turns, because he will have ample opportunity to perfect them while making the circuits necessary for learning to land. The first part of a circuit consists of taxying but, before this is learnt, the instructor will teach his pupil the procedure to adopt when the engine is being started. The engines of most light aeroplanes are started by swinging the propeller by hand. The safety of the engineer swinging the propeller is largely dependent on the pilot in the aircraft adhering rigidly to the rules concerning the ignition switches. When the engineer is ready he calls out “Contact”; the pilot replies by repeating the word just before he pushes the switches up. If the engineer requires the switches put in the off position, he calls out “Switch off”. The pilot repeats these words just after he has switched off. The term “Switch on” is never used in place of “Contact” because its use might cause confusion with “Switch off”. The pilot should see that the throttle is closed - lever pulled back - before putting the switches on contact. Is Petrol Tap Turned On? Before having the engine started the pupil must see that the petrol tap is turned on. This is an important habit to develop, because in certain circumstances the carburettor and pipes might hold enough petrol to allow the machine to rise into the air before the engine stopped through lack of petrol. At some time during his early training the pupil will learn to swing the propeller himself. He may do this when another pilot is seated in the aeroplane, or he may do it when there is no one in the aeroplane. Chocks in front of the wheels are always desirable, and are doubly so when there is no one in the aircraft. Apart from rigid adherence to the use of the terms “Contact” and “Switch off”, it is wise always to handle a propeller as though the engine were switched on. Sometimes one hand and sometimes two are best for propeller swinging. In all instances, however, the weight of the body should be so placed on the feet that there is no tendency to fall forward when the engine starts. THE INSTRUMENTS of a Miles Whitney Straight side-by-side, dual-control monoplane. Along the top, from left to right, are the engine revolution counter, the air speed indicator (A.S.I.) and the altimeter. Immediately below these is the bubble cross-level and, in the centre below that, the flap control, which has an intermediate position. To the left of the flap control are the engine oil-pressure gauge and the ignition switches. To the right of the flap control is the petrol gauge for indicating the amount of fuel in the port or starboard tanks. The compass is mounted below the instrument panel of the machine. When the engine is cold, it is necessary that rich mixture should be sucked into the cylinders before the ignition switches are put on “contact” and an attempt is made to start the engine. The procedure on light aircraft is, generally, first to flood the carburettor and then to turn the propeller round two or three times in the starting direction. During this propeller turning the switches must be in their “off” position. The throttle may sometimes be opened a little way during the sucking-in process, but must be closed before switching on. Once the engine has fired, however, the throttle may be opened again slightly to keep the engine running. You can read more on “How an Aeroplane Flies”, “Learning to Fly” and “Training R.A.F. Pilots” on this website.